One of the best things about blogging is that you get to open up your world to all sorts of amazing, generous, interesting and talented people that you just might not bump into when immersed in the minutae of day to day life. Linda Janssen is one such person for me – amazing that is, not minutae! An American living in The Hague in Holland, Linda is the lady behind the fabulous blog Adventures in Expatland where she charts her particular journey as someone who wants to make a difference: as an expat, a wife, a mother and as an aspiring writer. But wait…aspiring no more. She IS a writer. And as you know, I love to support those who are brave enough to reach for what their deepest heart desires so I am both completely thrilled and deeply honoured to play host to her virtual book tour here at Gidday from the UK. So here’s to you Linda – chin chin! And for all you aspiring…well anything you want to be’s …out there, read on to see how inspiring reaching for your dreams can be. On the latest stop of my ‘virtual book tour’ I’m here in London at Gidday From the UK. I’m visiting a number of my favorite blogs to share a little about the writing journey that has led to the publication of a book to which I’ve contributed. Specifically, I’m in Fabulous Finchley in Northern London today. A big thank you to Kym for hosting me in her new abode so soon after moving, but she’s a brave gal and not one to let a recent move keep her from having company. Last week was the launch of Turning Points: 25 Inspiring Stories From Women Entrepreneurs Who Have Turned Their Careers and Their Lives Around, and it’s been a roller coaster ever since. The book is edited by Kate Cobb, a women’s business and executive coach (www.movingforwardyourway.com) and Brit now living in France. Our publisher is the formidable Jo Parfitt (www.joparfitt.com) who runs Summertime Publishing, a niche publishing house that specializes in fiction and non-fiction books by and about expats and international living. I’m new to the publishing arena, and while I did a fair amount of research beforehand into what I could, should and would do to help get the word out about the book, I wasn’t entirely sure how it would all go. The answer in a word is fabulous. But I would credit the book’s concept for that more than anything else. 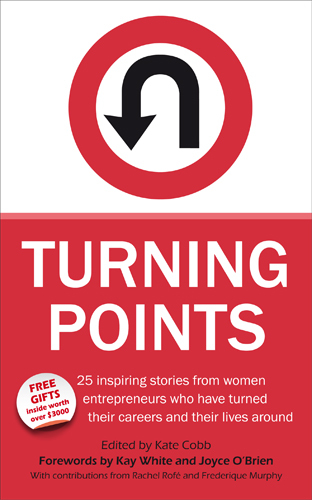 Turning Points is an inspirational collection of uplifting personal essays in which women from all over the world, living different lives and working in various fields, reach a pivotal moment or series of events that triggers within them the acknowledgement that they simply cannot continue on in the same manner. Change in their professional and personal lives is demanded and inevitable. Each woman shares her own situation, how her particular turning point came about, and the manner in which she responded. Even better, each contributor offers the resources (books, websites and the like) that helped her implement change, and lessons learned along the way. I’ve been reading Kym’s posts for quite some time now, and it’s difficult to point to just one aspect that pulled me in. She’s witty and amusing with an eye for the absurd yet isn’t afraid to display her romantic side. She’s a voracious reader who kindly shares her mini-reviews; I enjoy the range of titles and authors, constantly adding to my own ‘must read’ list. I’m drawn to her story (arriving in the UK for love and courageously choosing to stay when it didn’t go as planned) but am liking her ending even more. When I started my blog, I was in the early stages of ‘coming out’ as a writer. I’d hidden my dreams and aspirations for too long, and knew that in order to move forward I’d have to put my writing and myself out there for all to see. Like Kym, I started writing articles, book reviews and interviews and slowly began to build up my published portfolio. We can’t do it all. In truth, who can? So we choose to do the things that bring us closer to our goals. I’m writing a non-fiction book about the importance of emotional resilience in living in countries and cultures other than your own. Contributing a chapter to Turning Points was a fork in the path, an opportunity that presented itself, another decision point. I helped start a writers’ group along with some other wonderful writing women here in The Hague, and over time I’ve come to trust their instincts and feedback. Now I share my deepest secret with them in the form of sections of a novel I’ve begun to write. The pace is slow, almost glacial at times, but just the fact that my words are seeing the light of day is enough for now. Blogging is the public portal through which many a writer now steps. As Kym states herself in her Gidday bio, sharing bits and pieces of everyday life has ‘reignited her passion for writing and she now wonders where it all might lead.’ With a writer as talented as Kym, it will be fun to watch. If you’d like to find out more about our book, please take a look at the website www.theturningpointsbook.com, or follow along on Facebook’s The Turning Points Book page or on Twitter @Turning_Points. A portion of all sales will benefit www.seedsfordevelopment.org. This entry was posted in blogging, Expat moments, Inspired by and tagged expats, Linda A Janssen, My Special Guests, Turning Points by Kym Hamer. Bookmark the permalink.